YES!!!! I was involved as a teacher in lobbying the legislature many years ago about salaries and other issues. Having public support made all the difference to us and when there was a strike once I became an attorney for public school employees. What unfolded in West Virginia, Oklahoma and Arizona last spring was not supposed to happen. Tens of thousands of teachers went on strike in bright red states where government-employee unions are weak. They were boiling over, angry at low pay and lawmakers who kept cutting taxes while letting school funding sink to woeful levels. The teachers in those states won raises, and so did the ones who walked out in Kentucky and Colorado. On the eve of Labor Day, many teachers are still boiling over. More than 30,000 teachers in Los Angeles voted Thursday to authorize a strike if their union and school district fail to agree on a contract. Earlier in the week, teachers in Seattle voted to strike in September if their union and school district don’t reach a deal. And North Carolina’s teachers are inching closer toward a statewide walkout. In some states, teachers have adopted an additional strategy. As Republican lawmakers champion austerity and tax cuts, unions in Colorado are pushing a ballot initiative to increase school funding. The referendum would raise the income tax for people earning more than $150,000 a year, and also the corporate income tax. So, 2400 staffers and volunteers are going to fill in for 31,000 teachers, nurses, librarians and counselors. That's not even 10%. Wouldn't send my children to school under those conditions. LAUSD is woefully underfunded. It serves the some of the poorest communities in California. In the more ritzy school districts, parents pay thousands per year during fund drives - you get yard signs that say tell everyone you’ve paid your annual nut, it’s a kind of shaming thing. Though we don’t have the terrible weather in winter, our schools also have 45 kids per class, nowhere near enough resources, non-functioning restrooms in run-down buildings, peeling lead paint, holes in walls, cucarachas, gang violence, little-no extra money for art, music, athletics. Sometimes, if they can, the parents will band together and pay a teacher themselves, after school hours, to bring art and music to their kids. It is pathetic. Thirty years ago the district built a new middle school downtown to serve around 2000 students...on a superfund site. The saga is indicative of the LAUSD’s mindset. The tried to convince the parents that hexavalent chromium was safe. It sits upon a subterranean reservoir of hexavalent chromium, a carcinogen, whose origin is the subject of a current lawsuit. And carcinogens trichlorethylene, methylene chloride and chloroform remain in the soil and possibly in the air. (Tom)Hayden's inquiry was the second state hearing regarding Jefferson and LAUSD school-safety issues; last summer, Assemblyman Scott Wildman made headlines with the revelation that LAUSD has a policy of siting new schools on industrial, largely toxic properties. Hayden's hearing brought forth more revelations: that the district had been out of compliance with state law, had violated its air-quality operating permit (113 separate violations were ultimately cited), and that its Health Risk Assessment - the document proving its safety for occupancy - had to be thrown out. Granted this was a long time ago, but don’t think for a minute all change has been good. But this happened at around the same time. It was a pattern. It’s hard to find enough uncontaminated land here to build 1 school, let alone a school complex. Industrial, aerospace mostly were completely unregulated for decades. The street mr520’s factory is on was a superfund cleanup site in the early 90s. The businesses in the area, none of which were the culprits, were required to mitigate the damages. Some got state help; the ones that didn’t went under. It’s a . Los Angeles is a hot mess in some ways but everyone wants to live here. The teachers and county have been negotiating for a very long time. The teachers have always gotten far less than what they need, and graft and grift are still huge problems in the county. I don’t have school kids anymore so the strike doesn’t affect me. I know this will throw families into chaos for a bit, but this strike is necessary for the kids of the future. The teacher strikes will have an effect not terribly different from the govt shutdown. Because there is no school today, the kids stay home but the parents cannot leave them unsupervised, and babysitters or the like cannot be gotten (or afforded), so the parents must stay home from work to care for their kids. The effect is similar to a massive sick-out with the added ugliness that nobody will pay the parents' backpay and some parents may lose their jobs over staying with their kids. 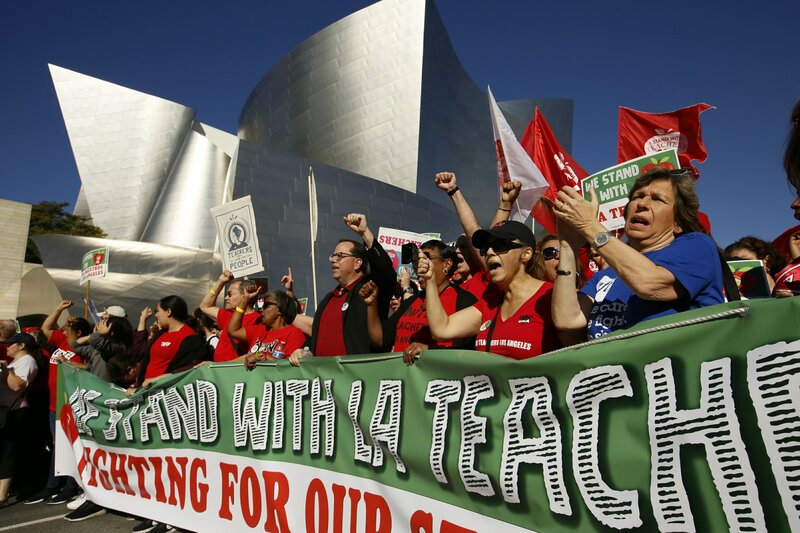 LOS ANGELES (AP) — Hundreds of firefighters are marching in downtown Los Angeles to support public school teachers as their strike enters its second week. Teachers at Wright State University went on strike today. They have been without a contract for nearly 2 years. OKLAHOMA CITY – After thousands of Oklahoma teachers walked out of the classroom last year, an Oklahoma state representative has proposed a bill that would prohibit teachers from going on strike again. Last March, the Oklahoma Education Association announced that it was seeking a $10,000 pay raise for Oklahoma teachers over three years, a $5,000 pay raise for support professionals over three years, a cost-of-living adjustment for retirees, and the restoration of funding for education and core government services. An estimated 10,000 teachers and their supporters packed the streets of Richmond, Virginia, on Monday to protest for higher pay and more funding. The teachers were demanding that the legislature increase the education fund to pre-recession levels and to raise teacher pay, which lags $9,400 behind the national average despite Virginia being the 12 wealthiest state per-capita in the United States. Activists with Virginia Educators United had expected only 2,000 people to turn out for the event and said they were delighted by the scale of the event, the latest in a series of actions by teachers across the US. CHARLESTON — Officials with teachers' and service personnel unions have called for a statewide strike starting Tuesday in response to the controversial education reform bill currently before the West Virginia Legislature. The strike was called following proposed amendments in the Senate to the House version of the bill that would increase the number of charter schools and reimplement a provision on education savings accounts that would allow 1,000 accounts for students with special needs. Most teachers and school service personnel in Harrison County will be out on the picket lines beginning at the start of the school day until 3 p.m., Junkins said. The others will carpool to Charleston to join picket efforts at the Capitol, she said. Logan County was the first to officially announce school closures within the hour following the union representatives' announcement. Within the next two hours most of the state's 55 counties had canceled school. CHARLESTON, W.Va. — This time the teachers' strike was only hours old when lawmakers acted. Just as the strike began Tuesday, the West Virginia House of Delegates effectively killed a complex education bill that sent state teachers to the picket lines nearly a year after a nine-day strike closed schools. The Republican-led House voted 53-45 to table the bill indefinitely. That means the bill won't go to the next step: a committee of Senate and House members who would try to come up with a compromise. Cheers erupted from the House galleries where hundreds of teachers were in attendance. It wasn't immediately clear whether the vote would end the strike, but teachers started leaving the Capitol afterward. Three unions representing teachers and school service workers said they would meet with union members before deciding on further action, which could include ending the strike. The unions scheduled a late afternoon news conference. American Federation of Teachers' West Virginia chapter President Fred Albert said "it was very clear today that the House heard our voice." Thousands of Oakland public school teachers went on strike Thursday, calling for smaller class sizes, more resources, and better pay in a city where tech money has made it difficult for the vast majority of teachers to survive. The Oakland Education Association – the union that represents teachers, librarians, counselors, and nurses serving 36,000 students in 87 schools –has been negotiating with the Oakland Unified school district (Ousd) for two years, said the union president, Keith Brown. “Oakland teachers cannot afford to live in Oakland,” Brown said at a news conference announcing the strike. “One out of five leave each year. Five hundred classrooms are left with inexperienced teachers each year. State spending on education has dropped. Better paying jobs are available. My former employer had and has many ex-teachers on its payroll. This school year, playing catch up in the classroom has become more common in Texas as state education officials have cited at least 220 teachers for leaving their jobs mid-school year and breaking their contracts, putting the teachers at risk of temporarily losing their licenses. Poor school management and an emphasis on standardized testing are two major complaints that spur teachers to leave, said educators gathered at a recent Texas AFT union rally at the Texas Capitol. Several teachers, including a few from Central Texas, say they had colleagues who left mid-year to take jobs at universities, pursue advanced degrees, or retire. The Texas Education Agency opens a “contract abandonment” case every time a school district files a complaint about a teacher leaving his or her contract early. So far in the 2018-2019 school year, the state has opened more cases of teacher abandonment than in any year since 2014. The number of contract abandonment cases hints at a trend that teachers and education groups say they’ve noticed in recent years — that teacher turnover is continuing to creep up as more teachers call it quits. Hundreds of teachers across the Sacramento Unified School District walked out of their classrooms and onto picket lines Thursday morning for the first time in 30 years, staging a one-day strike alleging unfair labor practices by the district. The Sacramento City Teachers Association expected a majority of its 2,500 teachers to join the walkout. The district, which serves 42,000 students, told parents in advance that schools would be open and classes would be appropriately staffed. A normal school day was scheduled, with regular attendance monitoring, bus service, meals and programs. Rosa Parks Elementary School teacher John Brindley greeted his 6th grade students with fist bumps as they walked onto campus Thursday morning, but remained out front with a protest sign rather than join them in the classroom. Collective bargaining sessions between the Columbia teachers' union and school board ended Thursday without an agreement and no future meetings scheduled. The Columbia Board of Education team insisted the contract include language that the contract would expire if the union isn't certified by July 1. The team from the Columbia Missouri National Education Association team said it couldn't ask teachers to agree to a contract with that language. The stalemate resulted from a law approved last year requiring certification elections of public unions conducted by the State Board of Mediation and re-certification elections every three years. The Missouri National Education filed a lawsuit challenging the law and St. Louis County Circuit Judge Joseph Walsh issued a temporary injunction in March, blocking enforcement. The injunction prevents the state Board of Mediation from scheduling union elections. Union and district negotiators disagreed sharply about whether the law should be recognized in the contract. "This isn't a new issue," said Duane Martin, chief negotiator for the school board team, said during the negotiating session, according to a transcript of Thursday evening's meeting provided by the district. "I raised it in February. Every counter has had this language in there." "And all of our counters have taken the language out," said Kathy Steinhoff, union president.